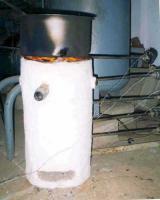 Paul Olivier is working from Vietnam, and had put together a comprehensive pdf article explaining the benefits of using TLUD and other gasifier stoves to avoid cooking smoke and create biochar. Cooking Smoke is a major health problem in both rural and urban areas in Vietnam and many other parts of the world, and improved stoves that can also produce biochar can also help urban and rural people retain nutrients in their soils, and reduce pollution. Today we put in operation for the first time the 250 gasifier with a stove top. This gasifier has a single 2-inch pipe that vents housing air to a warmer grate. This pipe had no butterfly valve or other restriction. We used the same small 80x80 mm fan as in the 150 gasifier. This fan had no problem at all supplying air to the reactor and to the 2-inch pipe. 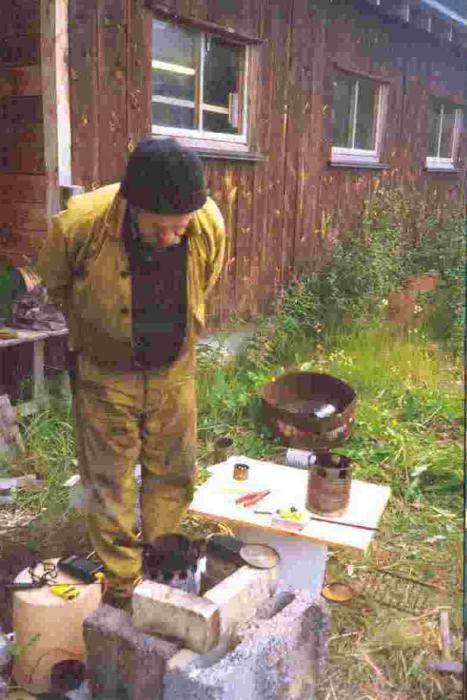 The burn lasted almost an hour on rice hulls, even though the height of the reactor was no more than 70 cm, the same height as in the case of the 150 stove. The warmer grate had sufficient heat from the housing to fry an egg, as indicated in picture 855.
although the camera did not have the right lighting to display it properly. The stove top was not properly reinforced when a large pot filled with water was placed on top. There was a deflection of a few mm's. However this can be easily remedied with two more lateral braces underneath the stove top. 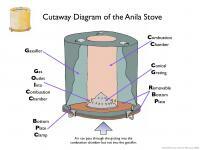 In conclusion, the 250 gasifier works well and delivers an enormous amount of heat. This report is in three parts: pioneer experiences; selection of photographs; and technical specifications of the PP stove. The report is based on e-mail interviews and materials provided by Paal Wendelbo in July 2008 and December to Paul S. Anderson, who has added interpretive content. Mr. Wendelbo has approved the basic content about himself, but Dr. Anderson is responsible for any errors, omissions, and editing. The Multifuel Combustion System (MFCS) is a flexible system designed for bioenergy household and institutional cooking. It is based on one energy unit (the Peko Pe) which single or multiple will cower all needs of energy for inside and outside cooking. The energy unit has to be seen as a “battery” loaded with energy, and when empty, replaced with a new loaded until the food is ready. Two units of 3 litres will cover the needs of a family, ½ full with fuel for coffee or tea, a bit more for porridge and 1 ½ for the whole meal. For boiling beans, empty the unit and place the pot on the glowing char. A simple handle to hold the pot for mingling the enchima will be a good help. (See the drawing). For institutional cooking more 10litre units will be the best 3 Units will boil 60 litres within 50 minutes and continue boiling 2 more hours on 6kg of chopped wood-sticks. 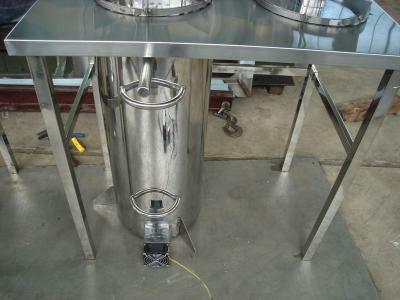 The system can be used for heating air or water, frying, cooking and baking bread, even smoking fish. 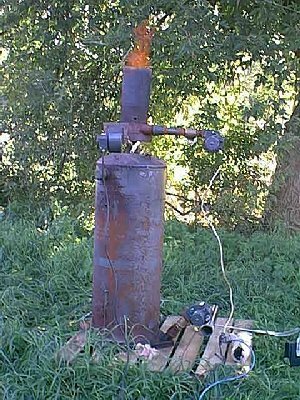 Attached you will find some pictures of a simple 3litre teststove I use to test types of biofuel. 1. chopped woodstick from energy forestry. 2. chipped wood from sawmillslabs. All types brought 3 litre of water from 17C to 100C within 13-15 minutes. No smoke no soot. 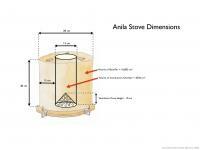 Between 600C and 700C flame temperature.